Nagapanchami, the festival of snakes, was celebrated this year in Karnataka on the 6th of August 2008, with the usual religious fervor. Devotees could be seen waiting since four in the morning in labyrinthine lines in front of temples devoted to Nagadevatas – snake gods. Massive quantity of milk was wasted by pouring it on stone-images of snakes to propitiate the reptilian gods. Tiny silver replicas of human body parts were offered to the snake idols. Nagadevatas would, it is believed, bless the devotees and rid them of all ‘doshas’! Seeing this devotion of the believers, a section of the urban environmental activists, especially the once-fashionable post-modern variety, sometimes come out with a curious claim similar to the one expressed by the Hindutva proponent quoted at the beginning of this essay. They argue that only a return to these sorts of pre-modern religious beliefs and ritualistic practices would save the fast depleting reptilian population. It is the rationalist world-view, they continue, that endangers the world’s flora and fauna by destroying their natural habitats. I argue in this essay that this view is erroneous, that this rather romantic view of religious beliefs and rituals does not have any empirical basis. I contend that it is only the rational understanding of ecology and nature that can help us prevent ecological disaster. The environmental activists and ethicists who take the anti-rational stand in their genuine anguish over the destruction of the natural world base their views on a partial understanding of the religious beliefs. Take for instance the festival of Nagapanchami itself. There is no empirical proof that this festival, with its elaborate ritualistic practices (most prominent among them being feeding the snakes or their idols with milk and the presence of snake-charmers) has ever had any positive impact on the preservation of the snakes. On the contrary, this festival has had disastrous consequences – not only in respect of the colossal waste of milk but also in respect of the snake population itself. This newspaper report from Mumbai is revealing: “A ritual of death plays itself in the name of propitiating the snake God. Around 2,000 snakes die annually on Nagapanchami, which has even earned Mumbai another first to its name: it has scaled the peak of world records for the highest snake mortality on this day“. The report quotes Vijay Aware, a naturalist, according to whom “the festival has always left behind a trail of dead and mutilated cobras. Nowhere have we heard of so many snakes being killed on one occasion”. The cobras have been seized from saperas in deplorable conditions: teeth brutally ripped out leaving septic abscess in their mouths; jaws sewn with just enough room for the tongue to protrude; and starving. This treatment continues until the saperas have raked in enough moolah, or simply till the snakes die. The ordeal unfolds a month before Nagpanchami, explained Lilyn Kamath of World Wide Fund for Nature India. `”The snakes are extracted from their burrows. Their mouths are stitched, their poison sacs punctured and fangs broken. They are then kept in earthen pots hung from trees until Nagpanchami,” maintained Kamath (The Indian Express, Mumbai, July 28, 1998). This extreme torture is meted out unintentionally to these snakes because believers are led by absurd views of snakes, couched in religious myths and folklores (and in the modern era, it is also fed by Indian masala movies) – that snakes drink milk, that they carry diamond in their forehead, that they listen and dance to the tune played by the snake-charmer, etc. As a result, the believers also tend to attribute human qualities to them. On the day of Nagapanchami, snake-charmers descend in droves on villages and towns and cities, carrying all sorts of snakes (all mutilated and starved) and people try to feed milk to them. None of the religious beliefs, of which the proponents of Hindutwa and their postmodern well-wishers gibber about, has discouraged the people from harming the snakes. On the other hand, a well-founded knowledge about the snakes, the need to protect their habitats, the role each species of animals play in preserving the delicate ecological balance, the disastrous impact the destruction of the environment has on human life itself, etc together with the strict implementation of the law (Wildlife Protection Act, 1972, The Prevention of Cruelty to Animals Act, 1960, etc) will have a greater impact on the protection of our reptilian friends. Thus, the scientific knowledge that snakes do not drink milk (though it is reported that “in a crises, when severely dehydrated, a snake might drink any liquid available” including milk. See: http://www.wildlifesos.com/rprotect/snakemyths.htm. 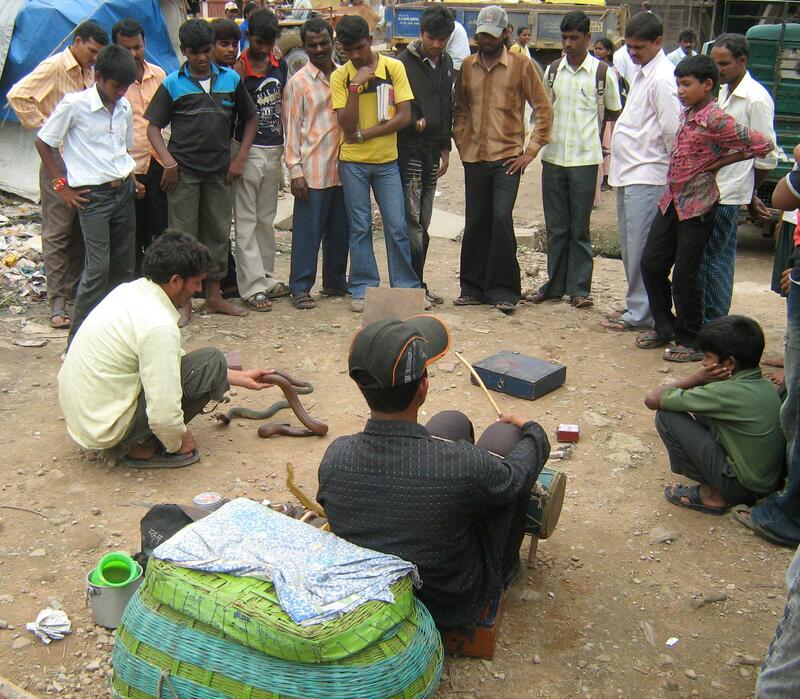 The snake charmers leave their snakes hungry for more than a month before the Nagapanchami in order that they are forced to drink the milk offered by the devotees) will deter people from offering them milk, leaving the precious commodity for better use. 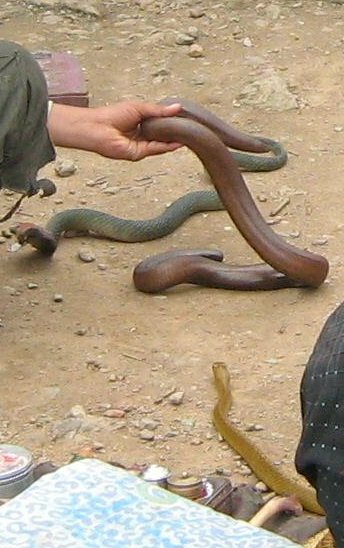 The fact that snakes do not have external ears to listen to the sound coming out of a been or pungi (the musical instrument used by snake charmers in India) may inspire the people to discourage snake charmers from torturing their snakes. The strict implementation of the laws has definitely played a major role in reducing the poaching of snakes over the years. But it has not yet completely stopped and for that the inducement provided by the festival of Nagapanchami is mostly to be blamed. In addition to this it is also necessary to have a rational ethical understanding about Nature and our, human being’s, place in it. Our present day knowledge of ecology and our environment informs us that we have no special right over nature and prompts us to discard the anthropocentric view of the universe presented to us by a number of religions. As Professor Paul Kurtz, the well known American rationalist writes in “The Affirmations of Humanism: A Statement of Principles”, we want to “protect and enhance the earth, to preserve it for future generations, and to avoid inflicting needless suffering on other species”. It is this rational understanding, and not religious beliefs and obscurantist rituals, which would lead us to protect other species and preserve our environment. while i fully agree with the factual position laid bare by the author that snakes are now tortured in the name of a festival, the blame must be laid not at the doorsteps of the religion itself but on the palms of its practitioners. the ostensible purpose of any festival in hinduism can be scientifically explained-no, i am not talking about lending any scientific colour to religion per se, but my point of view is that hinduism has successfully attempted to ingrain seasons, conservation, hygiene and several other aspects into festivals which can be seen to be associated with particular seasons, particular food items, particular bathing/personal hygiene rituals, etc that suit those seasons, specific animal associations and so on. what ought to have been rigorously practised scientifically has lost its original sheen and has become ritualistic with the scientific temper fully discarded and lost to public knowledge. thence, it has become easy for moneybaggers to misuse the festivity to pick a few coins at the cost of gullible people who have been coached by generations to read religion and science separately. give me any festival and i can give the scientific reasoning behind it, but i surely cannot defend the barbaric acts that have been coloured as rituals. your article is a reminder that scientific temper is the need of the hour and religion has lost on this front. The last sentence of Harishkabish’s response – “Scientific temper is the need of the hour and religion has lost on this front” – sums up my essay. But the statement he made at the earlier part of his letter that “… the blame must be laid not at the doorsteps of the religion itself but on the palms of its practitioners” is not, according to me, a correct evaluation of religious practice. Similar kinds of arguments are put forward by most religious enthusiasts whenever a criticism is made against any religion – be it in the context of a terrorist attack, harassment of women, cruelty to animals, or meaningless rituals. But the fact is the religious beliefs are largely to be blamed for the actual day-to-day practices of the believers. Hence a major part of the solution also lies in the removal of these beliefs along with other measures. It is true that there are rational explanations for many of the rituals/festivals followed by people belonging to various religions – not only Hinduism but other religions too. But in a number of cases, the reasons attributed are based upon the knowledge existing at the time of the origin of that practice. Though we cannot fault today the reasoning of the original practitioners (because that was the level of their knowledge then), there is no point in continuing with the practice even after the ideas held by our ancestors have been proved wrong. This practices have became even more dangerous when they are couched in religious beliefs – that is precisely what happened in the case of festivals like Nagapanchami. The solution here is to dispel the religious beliefs associated with these festivals by disseminating the correct information. While I agree that our treatment of the natural world must be based in scientific fact and not on religious beliefs, I feel it does no good to demonize environmentalists who indeed act for the environment. While science gives us the necessary information, it is not scientists (who are often funded by questionable sponsors) who organize rallies to stop forests from being cut down. It is environmentalists. While some may be ignorant and hold romantic views on old religious beliefs, this is not the case with all of them. It may also be that certain statements are taken out of context, for example, comparing some ancient religions of tree worship to others, like Christianity, which demonize the forest and the animals within it. In this case, it would not be to say that we must all go back to the ancient Celtic religions, but only to say that it is easier to convince tree (or in this case, snake) worshippers that what they are doing is in fact harming and not helping that which is being worshipped and then to educate them, than to convince others that in fact, no, evil is not something that can be embodied in nature and therefore humans do not have the right to destroy simply because we can. Environmentalists are seen as radicals, but many are educated and have a base in science. They are activists because they are not content with simply putting the information out there; they are concerned with physically doing something to help the environment. Thus, scientists and environmentalists should work together, not be at odds. Come on, where did I demonize environmentalists? I am one among them – in fact, one of my friends once introduced me to one of his friends as an eco-fanatic! My target in this essay was not environmentalists in general, but a section of them who, I quote from my essay, “argue that only a return to pre-modern religious beliefs and ritualistic practices would save the fast depleting reptilian population. It is the rationalist world-view, they continue, that endangers the world’s flora and fauna by destroying their natural habitats”. I have nothing to disagree with the arguments put forward by Alex.